(AP) GENEVA - The United States and Russia failed on Friday to bridge differences over a plan to ease Syrian President Bashar Assad out of power, end violence and create a new government. That set the stage for the potential collapse of a key multinational conference that was to have endorsed the proposal. On the eve of Saturday's conference, U.S. Secretary of State Hillary Rodham Clinton and Russian Foreign Minister Sergey Lavrov met one-on-one for about an hour in St. Petersburg, Russia, but could not reach agreement on key elements of U.N. envoy Kofi Annan's proposed plan for a Syrian political transition, officials said. A senior U.S. official traveling with Clinton said areas of "difference and difficulty" remain and was not optimistic that the gathering in Geneva would produce agreement. "We may get there tomorrow, we may not," the official told reporters as Clinton left Russia for Switzerland, where she arrived early Saturday morning. The official said Clinton and Lavrov would try to resolve differences in Geneva out of respect for Annan, the former U.N. chief whose efforts to end the Syrian crisis have thus far fallen short. The inconclusive results of the Clinton-Lavrov meeting may presage the unraveling of Annan's plan to end 16 months of brutal violence in Syria by creating a national unity government to oversee the drafting of a new constitution and elections. The United States and its allies attending the conference are adamant that the plan will not allow Assad to remain in power as part of the transitional government, but Russia insists that outsiders cannot dictate the composition of the interim administration or the ultimate solution to the crisis. 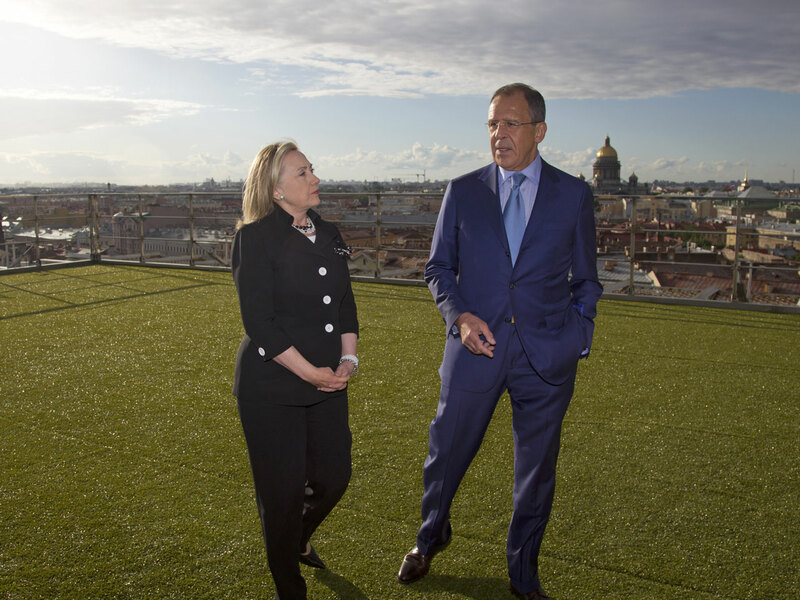 "(We) agreed to look for an agreement that will bring us closer based on a clear understanding of what's written in the Annan plan that (all) sides in Syria need an incentive for a national dialogue," Lavrov said after meeting Clinton, according to the Interfax news agency. "But it's only up to the Syrians to make agreements on what the Syrian state will be like, who will hold (government) jobs and positions," he said. Lavrov predicted the meeting had a "good chance" of finding a way forward. "But I am not saying that we will agree on every dot." But failing to agree on every dot may well be the plan's undoing, particularly if Russia refuses to except the implicit demand that Assad leave power. Annan on Friday laid out his expectations for the conference in an op-ed in The Washington Post that tracked very closely to the draft of his proposed plan, according to diplomats familiar with it. .The future government in Syria, he said, "must include a government of national unity that would exercise full executive powers." This government could include members of the present government and the opposition and other groups, but those whose continued presence and participation would undermine the credibility of the transition and jeopardize stability and reconciliation would be excluded," Annan said. Such a proposal does not explicitly bar Assad, but the U.S. and other Western powers that will participate in the conference said that is obvious and that the Syrian opposition will not sign on to the plan unless it excludes Assad. The senior official said Clinton and Lavrov also discussed the real danger for the region if the uprising in Syria that has killed some 14,000 people doesn't end peacefully. Already, Syria has shot down a Turkish warplane and Turkey has responded by setting up anti-aircraft guns on its border with Syria. They also discussed the "serious risk" of destabilizing Jordan and the potential impact on Israel. On Friday, Syrian troops shelled a suburb of Damascus, killing an estimated 125 civilians and 60 soldiers..
Russia is Syria's most important ally, protector and supplier of arms. Diplomatic hopes have rested on persuading Russia to agree to a plan that would end the Assad family dynasty, which has ruled Syria for more than four decades.